I’ve been hankering for a streamlined selection of clothing for a while now. The phrase “I’ve got nothing to wear!” parts from my lips far more than I care to admit, even when my wardrobe actually looked a little like THIS a week or two ago. A statement jacket is the hero of any wardrobe. Whether paired with your oldest, most beaten up jeans and a holey old T-shirt, or with an equally embellished, statement party dress, a trophy jacket looks chic whatever the occasion. I personally like a cropped boucle number, tribal beaded piece, this unlined River Island Jacquard choice or even a neon one! Up until late 2011, I wasn’t a huge fan of jeans. Trousers, leggings, jeans… I wasn’t having any of it. My recommendation? Save those pennies and snap up a pair of The Legging jeans by AG Jeans. Adriano Goldschmied is my jeans hero. They’re soft, hold the perfect amount of stretch, sit at the perfect area of your hip and wash extremely well. Jeans are going to be that hardy friend who simply doesn’t leave you: your kindergarten friend who will stick up for you, fight the last battle and see you through sticky situations. I love wearing mine with knits, shirts, T-shirts, singlets, you name it. C’mon Michelle, you don’t need to tell ’em a T-shirt is a worthy object of affection, right? Wrong. Owning just one a w e s o m e tee means nearly any outfit can be Gold Outfit Points worthy. Having tried and tested a huge variety, I can confirm the best are always the roll-up sleeve tees by Topshop and of course Alexander Wang’s offerings. Always Wang. Now I’m a strong believer that the jumper is an all-year round garment. Hear me out on this, summer sun worshippers. I prescribe two jumpers for your sartorial enjoyment — a lightweight summer knit to be tucked in to crisp tailored shirts and A-line skirts; and an oversized number like this Soneed Convertible Dolman-Sleeve Knit Top by YesStyle for cosying up in during the brisker months. 2013 saw another revival of 90’s Mania. We’ve been pretty clued up about Clueless in the sartorial stakes, spicing up the wardrobe with loosely Spice Girls inspired attire and we’ve been ramping up the grunge chic look that Kate Moss popularised in the day. The singlet is one versatile baby, isn’t he? Thinner than thin spaghetti straps (now there’s a term you never thought would be shimmied out on Daisybutter), the perfect midweight texture and wearable beyond belief, the singlet can be teamed with little skater skirts, worn on top of a lightweight turtleneck, paired with ripped up jeans and a biker boot, or worn demure and darling with a midi skirt. Do I need to keep churning out the reasons? Shop yours now. I’m going to be a blogger cliche now and recommend you to hop, skip and jump over to your nearest Zara – or click online, much less hassle 😉 – and snap up a statement necklace. They’re ideal for pairing with a white tee and jeans to up the ante a little. And they’re pretty great on hangover days where you must leave the house. Other favourites: Stella & Dot, Ever Ours and Topshop. When contemplating the footwear department of this guide, I quickly ditched flats for a chic boot. There’s something much more statement about a non-conventional boot, y’know? Plus I’m really into the clunky shoe recently. Something with a sturdy heel adds plenty of style led charm to the capsule wardrobe, a little like these All Ours ones by Topshop. 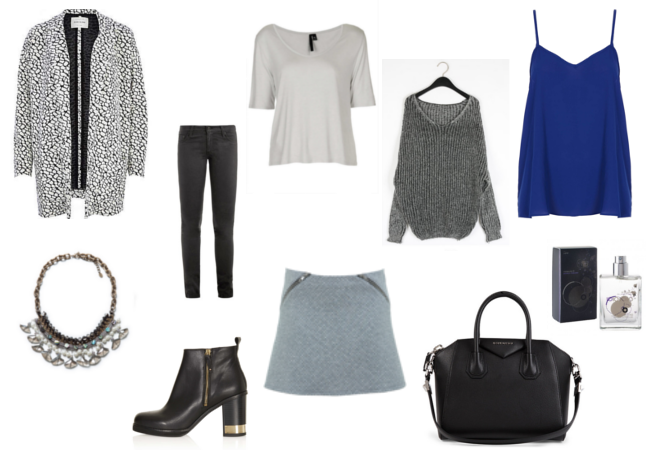 We’re nearly done with our capsule wardrobe – scared yet? A skirt is absolutely timeless and is a winning piece to complete re-feminize your look. This can easily be switched up with a dress: you all know my tip for layering on top of a dress by now, eh? With skirts comes my shape advice though – take note ladies. Apple shapes, try something a little more streamlined in the midi length department to show off some stunning pins. To enhance top-heavy or Hourglass figures, it’s got to be the skater. Pear shapes should balance their skirt of choice with a statement necklace, and for AW13 – everyone make sure you’ve got a quilted leather number slotted in the 10-piece ‘drobe. Hardware is everything – check the quality and the colour contrast. Black looks good with silver, gold, gunmetal and rose gold. Navy is beautifully complemented by silver. White and rose gold are a match made in heaven. Size: too small and you won’t be able to take your kitchen sink. Too large and you’ll look on the unstylish side of hobo. My current capsule wardrobe recommendations? The Givenchy Antigona, Chloe Baylee and Prada Saffiano Lux. Fragrance wise, I have a very small selection of perfumes. I prefer to be ‘recognisable’ by a fragrance that I wear and so I rarely switch it up. Whilst my Chloe scent has the current everyday slot, I’m very interested in the personable properties of the Escentric Molecules Molecule 01. You’ve heard the raves. That, my friends, concludes my capsule wardrobe essentials. Ten hardy items, prepared to give you their all for every taking. It’s worth noting that, from experience, it’s always worthwhile to be prepared to save a little longer and splash the cash on a pocket-emptying investment. Your 10-piece capsule should and will last you for decades, offering a classic, timeless, effortlessly chic look.